Did President John F. Kennedy see a UFO? This article says he did. Just a few minutes into the cruise everyone on board the launch (including JFK) were stunned when a disc-shaped object appeared within several hundred feet of their boat. The object was about 60 feet in diameter. The middle was slightly raised and part of a top that was a dull, metallic grayish color. The bottom of the craft was very shiny and hard to look at. There were no noticeable windows or openings. The object seemed noiseless and no signs of obvious propulsion could be seen. It has also been reported that Kennedy met with UFO contactee George Adamski. This leads to Adamski's claim that he secretly met with President Kennedy around October 1961 to deliver a message from the “space brothers.” According to Major Pederson, the message contained advise on a world crisis to occur in about a year that was later revealed to be the October 1962 Cuban Missile crisis. If true, the contents of the message may have helped Kennedy develop the right strategy for dealing with a conflict that could easily have escalated into a Third World War. 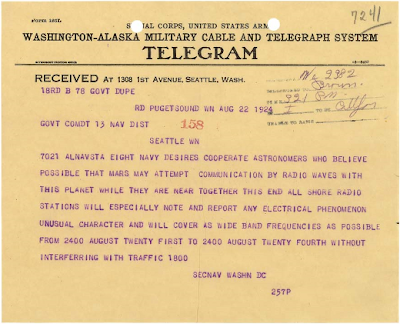 The extraterrestrial message, apparently, also contained an invitation for Kennedy to meet with them in Calfornia. Osama bin Laden was "within the grasp" of US forces in late 2001 but escaped because then-defense secretary Donald Rumsfeld rejected calls for reinforcements, a hard-hitting US Senate report says. We caught Saddam Hussein. Osama bin Laden walked away. 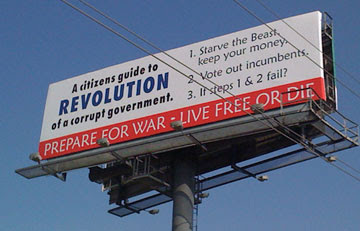 Cheney for President in 2012? There's crazy and then there's freaking insane. 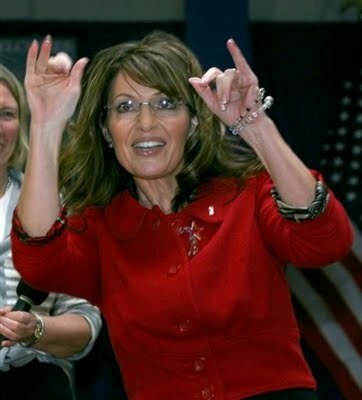 I allege that Sarah Palin, while in office as Governor, faked a pregnancy. She told the public she was pregnant, when she was not. In the final days of her "pregnancy" she wore a fake pregnancy suit, including wearing a fake pregnancy suit to a Republican Governor's Convention. Interview with an Oswald witness - Patricia Puckett Hall was 11 when she met Lee Harvey Oswald. Read here. One autumn day in 1963, her two younger brothers got into a scuffle in the front yard where Johnson's grandchildren, who lived six blocks away, spent most of their free time. A roomer witnessed the roughhousing and stepped in. Hall, then 11, watched as he sat the boys on the porch, one on each side of him. "I want to tell you something really important," Hall heard the slender young man say. "I want you to listen. You're brothers. You have to look out for each other." Then, "don't ever do anything to harm another human being." James Douglass, author of JFK and the Unspeakable, is interviewed for about an hour here. His book is one of the best on the subject and one of the very few that put the assassination into an historical, political and spiritual perspective. OpEdNews: THE JFK CASE: WHAT INFORMANTS ARE STILL OUT THERE? A good article with lots of links. I just added a new feature to the blog: a random atheism quote generator. It's right under the Atheist Blogroll.I thought they might have kicked me off The Atheist Blogroll because I haven't posted on religion (or nonreligion) lately but they haven't. Then again one atheist blog I visited recently basically tells the reader what she had for breakfast that morning. If you have a blog please consider joining the Atheist Blogroll. They even accept agnostics (although I think they kind of look down on them)because Agnostics do not have a belief in God and so can be considered soft atheists. Not sure about Buddhists. Personally I call myself a nontheist because many atheists rub me the wrong way. Sure I no more believe in the Christian God any more than I believe in Zeus (more of an agnostic on Odin) but I am not going to say that Paul Tillich's "ground of being" does not exist (mainly because I don't know what the hell it is). Many atheist bloggers attack only the worst caricatures of belief, although most believers are like that. So what do I believe or not believe? I do not believe in a personal God or an impersonal god either but am not entirely convinced that is not a god that transcends these narrow categories. Perhaps I am talking about God in the Einsteinian sense that Richard Dawkings describes. (And really Richard it wouldn't kill you to read a little theology. )Paul van Buren said that simple, literal theism is false, and qualified literal theism is meaningless or unintelligible, and I am sympathetic to this view, but then don't all the mystics say that god is beyond human understanding and trascends all our narrow categories? I used to be an agostic but that does sound kind of wishy-washy so now I am a proud nontheist. Given our current scientific understanding there is no reason to believe that there is a life-after-death, and fairly good reason to believe there is not, however given the limited nature of our current level of scientific understanding I do not think the possibility can be completely dismissed. We do not know why the Universe exists or how it came to exist really and "we're working on it" is somewhat unsatisying. Still I refuse to base a theology on ignorance. Someone recently won an atheist contest with the slogan "Faith is no reason." If I kill a rodent I do not believe that it will continue to exist after death, so why should a slightly more advanced mammal? If there is nothing after death, then there is nothing to be afraid of. The problem with the god hypothesis (and is it really even a hypothesis?--certainly it is not testible) is that it really doesn't explain anything. I cannot explain the Universe, therefore it must have been made out of nothing by some Entity, which actually sounds kind of creepy to me. Speaking of atheist quotes, however, I like one by Christopher Hitchens: "What can be accepted without evidence can be dismissed without evidence." That's from memory but it's close. Gary Clark was a 21-year-old airman at Malmstrom Air Force Base in Great Falls, Montana when John Kennedy was killed. His story here. On Nov. 22, 1963, a Friday, Clark said the room’s quiet was disturbed by the different-sounding ring of a call from NORAD headquarters. He said he watched as a senior director and his staff, seated at a raised dais, listened and verified the phone message using a cryptographic process. The officer, he said, called him crisply by name — “Airman Clark report” — and told Clark he was about to learn something very important, and that he was to go around the room and inform everyone else of what he had heard. Clark said he can still hear those words, “President Kennedy has been assassinated,” and that Van Quill also told him “assassins” had fired from an overpass. Also, Clark said, the officer told him the U.S. government did not believe the killing was an attack by any foreign country. 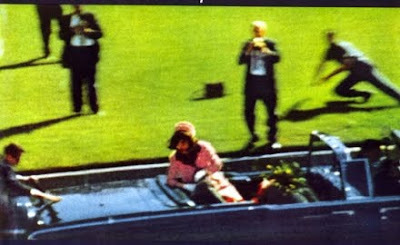 The Kennedy assassination has been the subject of a number of songs. Listen here. I like Lou Reed's "The Day John Kenney Died." 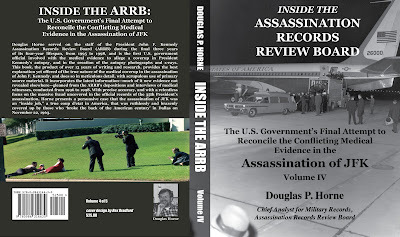 FBI Special Agent Jim Sibert observed the JFK autopsy. Interviewed recently he says "I don't buy the single-bullet theory." The left has its birthers as well. 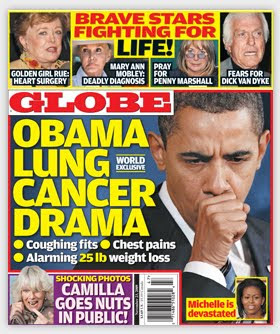 The left's birthers, much fewer in number, are focused not on the President but on Sarah Palin. A blog called Palingates still thinks that baby Trig was not Sarah's but her daughter's. Personally I choose to believe this theory until Sarah products the child's birth certificate. Fair is fair. When the doctor's bill arrived in our mailbox, it came with a typo. In the box describing the procedure, someone had typed "Abortion". Instead of starting over with a fresh form, they painted it over with a thin layer of Wite-Out, and retyped, "Miscarriage". For some reason it just felt like salt in the wound. Update: Another blogger asks wwwIs there a Trig Truther Story on the Horizon? There is also a rumor that Sarah Palin's underage daughter Willow is pregnant. The Jim Garrison Tapes. Watch here. News to me. Back in 1924 the Navy attempted to listen to communications from the planet Mars. 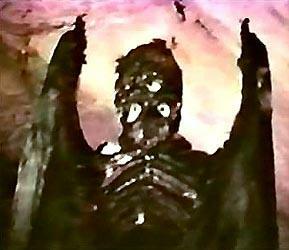 WingNutDaily: Crazed wingnut and bad actor Pat Boone has a new plan--surrender. His rallying cry: CALL ALL OUR TROOPS HOME – AND NOW In part two he also calls for an end to efforts to stop Iran from developing nuclear weapons. But we should drop leaflets on them telling them that our religion is better than theirs. Oh, and we should offer a $10 million dollar reward for Osama bin Laden. Boone is apparently unaware of the $25 million dollar reward offered now. 52% of Republicans think that Barack Obama stole the Presidency with the help of ACORN. That's 26% of all Americans who are dangerously deluded. There were Democrats who thought Bush stole the elections of 2000 and 2004 but not as many. Abraham Bolden, the first black Secret Service agent on the White House detail, had vital information for the Warren Commission. After he attempted to contact the Commission he was set-up and sent to prison. Here his story in his own words here. His compelling first-hand account runs just short of an hour. Rightwing blogger wants to pray for Obama. To die. 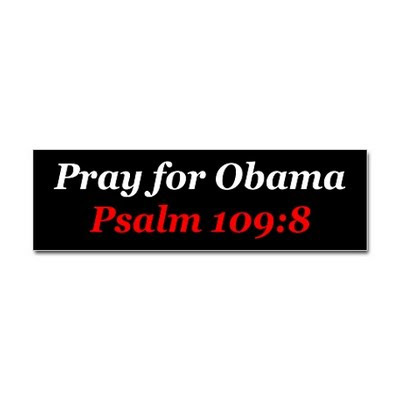 Psalm 109:8 - May his days be few; may another take his office. "If there was foul play that's what makes sense. Mike was a threat to somebody. I'm pretty cynical about government but for lack of a better word I think the Bushes and their cronies are a bit evil but Mike was loyal to them." A top scientist at the Large Hadron Collider (LHC) says that the titanic machine may possibly create or discover previously unimagined scientific phenomena, or "unknown unknowns" - for instance "an extra dimension". So let me see if I've got this right. They're going to unleash enormous amounts of energy, recreating conditions similar to those of the Big Bang, warping time and space, just to see what will happen? Cool. Former former Pentagon intelligence analyst Ted Van Dyk has an interesting article here on the JFK assassination. As a former Pentagon intelligence analyst, I was delivering a lecture at the Defense Intelligence School to a group of career military officers from all branches of the service. Midway through my lecture, a Navy captain entered the room, moved me aside at the podium, and announced the following: "President Kennedy, Vice President Johnson, and Texas Governor Connally all have been shot and killed in Dallas. Stand by for further information." There were a host of other unanswered questions: The CIA, during the period, was sending supposed "defectors" into the USSR to gather intelligence. Was Oswald one of them? Or was he, in fact, a genuine Soviet asset? As a Marine, he had been stationed at a highly classified facility that monitored CIA spy-plane flights over the Soviet Union. For whatever it is worth, my best guess is that a rogue CIA/mob group planned and engineered the assassination, setting up Oswald for blame. He was a part of it but, perhaps, only as "the patsy" he said he was. I was an intelligence analyst for 7 1/2 years, mostly as a Reservist,and then assistant to Sen. and VP Humphrey for five years and, later, a State Department official. I had general knowledge during that entire period of a defector program---although no specific knowledge. The Soviets were known to have their own counterpartdefector program, sending agents into the West. There was always deep suspicion when a supposed "important" defector came West. Oswald would have been seen as small fry, both by us and the Soviets, and of no particular importance. It is conceivable that he worked both ways. Was RFK Working with LIFE magazine to "Take Down" LBJ in November of 1963? Did LBJ strike first? "Beginning in late summer 1963 the magazine, based upon information fed from Bobby Kennedy and the Justice Department, had been developing a major newsbreak piece concerning Johnson and Bobby Baker. On publication Johnson would have been finished and off the '64 ticket (reason the material was fed to us) and would probably have been facing prison time. At the time LIFE magazine was arguably the most important general news source in the U.S. The top management of Time, Inc. was closely allied with the USA's various intelligence agencies and we were used...by the Kennedy Justice Department as a conduit to the public...The LBJ/Baker piece was in the final editing stages and was scheduled to break in the issue of the magazine due out the week of November 24 (the magazine would have made it to the newsstands on Nov. 26th or 27th). It had been prepared in relative secrecy by a small special editorial team. On Kennedy's death research files and all numbered copies of the nearly print-ready draft were gathered up by my boss (he had been the top editor on the team) and shredded. The issue that was to expose LBJ instead featured the Zapruder film. Every conservative in the country today is a proud "Reagan conservative." This interesting post from Pink Flamingos Pink Flamingos shows that many of them didn't have much use for him when he was actually the President. Howard Phillips described Reagan as ”fronting as a useful idiot for Soviet propaganda." “…Conservatives may not back President Reagan for reelection in 1984 unless he reverses what they consider “almost a stampede to the left” in the White House, New Right leaders said Tuesday." So actress Christian Serratos (19) from that Twilight movie would rather go naked than wear fur. I'd rather she go naked than wear fur too. Nearly a quarter century after U.S. Sen. Jim Eastland's death, Klan leader Edgar Ray Killen still talks about the many jobs he did for the veteran lawmaker. Former inmate Larry Ellis told the FBI that Killen talked repeatedly of tasks he did for Eastland, quoting Killen as saying, "There was not anything I would not have done for him. He made miracles happen for me. He was and will always be my No. 1 hero." Killen is serving 60 years in prison following his conviction in 2005 in Neshoba County for orchestrating the Klan's June 21, 1964, killings of three civil rights workers. Killen, who grew up in neighboring south Neshoba County, said he developed a relationship with Eastland after becoming friends with Leander Perez, an arch-segregationist in Louisiana. Documents from the Eastland papers at the University of Mississippi show Eastland and Perez shared information on purported communists. Senator Eastland had other connections as well including meeting with JFK assassination figure Guy Banister. See here. The Hatboro chief said a major problem too nowadays is that the heroin available is purer and thus more potent, which increases the potential for overdose. "It's a perfect storm when you combine the increased access to prescription pills and the influx of pure heroin," said Fialko, who noted the amount of heroin being exported from Afghanistan is skyrocketing and finding its way in ever purer form to American streets. There are a lot of stories on rising heroin use in this country. Few make the Afghanistan connection. Strippers! This Dallas News story features an interview with Ruby stripper Joyce Gordon aka "Joy Dale". George Hutchins is running for Congress and he has a very colorful website. As in every word is a different color. The content is equally colorful not to mention crazy. Apparently he believes that the Civil Rights Act led to the election of Barack Obama and so the solution is to repeal it. To stop the OBAMA-NATION Socialists in Washington DC, we must first go to the root of the POISON TREE, which created all them. This POISON TREE, is the "Social Engineering" located within the so-called 1964 Civil Rights Act, to the U.S. Constitution. But to really appreciate the crazy you need to see it in color. Hutchins is in favor of creating "more better jobs" and is in favor of "Capitol Punishment".